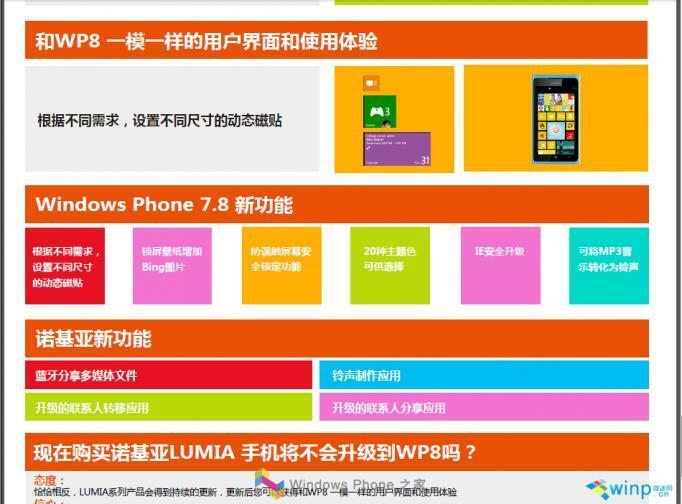 Features of Microsoft’s upcoming Windows Phone 7.8 update have been leaked in what is purported to be a slide from a Nokia training presentation. In addition to a new start screen, the software brings three new Live Tile sizes that users can customize, more themes, and upgrades to Internet Explorer. WPCentral reports that there are 20 new themes in total, matching those that are available in Microsoft’s recently-released Windows Phone 8 platform (which, of course, Windows Phone 7.x users won’t get). There’s also a security upgrade to Internet Explorer, the built-in web browser, and the update also introduces the ability to edit MP3 files to create ringtones. Like Windows Phone 8, Windows Phone 7.8 will also feature the ability to set Bing wallpapers, rather than a single photo, according to the slide. Microsoft promised that Windows Phone 7.x users would be still be supported by future updates, despite not being selected for a Windows Phone 8 upgrade. It’s reassuring for those users to see that the Redmond-passed software giant hasn’t forgotten about them, and that they have new features to look forward to. Of course, this slide features just a small number of the improvements and enhancements that will come with the Windows Phone 7.8 update, so expect to see even more as we near close to its release. Are you looking forward to Windows Phone 7.8?